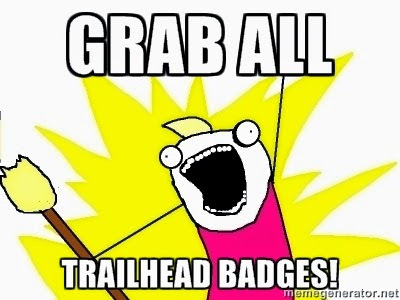 Few days ago the Salesforce team released 4 new Trailhead modules, and I decided finally to have a look at it...with my style. I may say "all in" or "all or nothing" style. I decided to do all the modules and see which topics were covered (and how deeply). With year of Force.com development it's been quite easy for me to complete in few hours all the modules, but I haven't earned all the points available (I did some mistakes when answering to questions) and I must admint I also learned something (expecially in modules I don't play a lot in my job). After 16 modules I have to say this is a really good starting point to start learning the basics of the Force.com platform, and sometimes the documentation goes deeper than you could expect, covering important aspects that sometimes you find out only after months of "real world" practice. 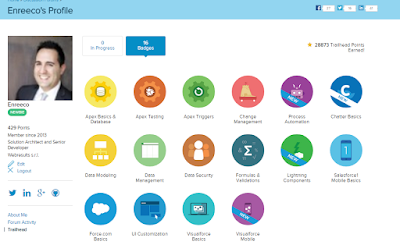 The Trailhead modules page lists all the modules in alphabetical order, but you can follow the 3 steps on the Trailhead main page to have a better study order. Process Automation: you learn the basics of process automation and the new Process Builder and Visual Workflows tools, cool ways to get your complex processes up and running in few clicks! Stay tuned for more modules! I'm gonna definitely suggest all my Company's interns to start learning Force.com using Trailhead, a funny and awesome way to learn the Force!